The Bengaluru campus of Indian Veterinary Research Institute (ICAR-IVRI) was established in 1972 by the assistance under DANIDA programme of Government of Denmark with the objective of large-scale production of Foot-and-mouth disease (FMD) vaccine. The campus, spread over 135 acres of land, has establishments at two locations: (i) Hebbal campus where the main research activity is being carried out, and (ii) Yelahanka, where animal experimentation facility exists, with biosafety level 3 containment. Country's FMD vaccine production technology was first implemented at this campus. 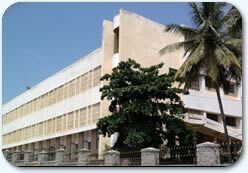 Since inception until the year 2010, ICAR-IVRI, Bengaluru campus was engaged in production of FMD vaccine. During 30 years period (1980 to 2010), a total of about 175 million doses of monovalent FMD vaccine (which equals to about 52 million polyvalent vaccine) was produced and sold. In recent years, the vaccine was supplied to different states for effective implementation of FMD control programme. During the last 43 years, besides the vaccine production, research on different aspects of FMD vaccine was undertaken, with the objective of improving the quality of FMD vaccine. Since 2010-11, emphasis has been given on strengthening the research on development of improved vaccines and diagnostics for FMD with contemporary research tools. The campus has been awarded "INTERNATIONAL GOLD STAR" award by Business Initiative Directions (BID), Madrid, Spain for FMD vaccine quality for the year 1988-1989. Over the years, IVRI Bengaluru campus contributed substantially to the revenue generation. The FMD vaccine supplied to the states has contributed in reducing the incidence of FMD where FMD control programme is in force. Due to availability of FMD vaccine research related expertise, linkages and collaborations could be established with private partners as well as International research organizations. The campus has developed two DIVA-enabled FMD diagnostic kits and the technologies have been transferred to commercial manufacture. Development of improved vaccine and diagnostics against FMD using Baculovirus expression system. Development of Adenovirus vectored recombinant FMD vaccine. Improving the efficacy and duration of immunity of FMD vaccine using novel adjuvant formulations. Development of early intervention strategies for control of FMD. Providing technical backstopping to DADF, GOI for having an effective FMD vaccine quality control mechanism for the country. Establishing correlation between in vivo potency testing and in vitro serology based assays as an alternate to cattle challenge in vaccine quality control. Development of attenuated FMD virus using codon de-optimization technology.